Your car’s battery is one of the most important things under the hood. It helps keep you warm in the winter and cool in the summer. It helps you listen to your favorite songs and helps keep you safe by alerting you when your seat belt isn’t fastened. And, more importantly, without it, your car wouldn’t go! One of the chief jobs your car’s battery performs is giving your engine the initial boost it needs to start. So, it goes without saying, you wouldn’t get very far without it. All that amounts to is the fact that being stuck in a position with a battery that is stone dead is devastating. It’s not like swapping out for a spare tire. If you are stuck with a dead battery, you are stuck. While you can’t tell just by looking at a battery if it is worn out, being in a situation with a dead battery is a very avoidable one. All you need is a little know-how about what you should expect out of your battery. That’s why we wanted to answer some very common questions about car batteries. How long your battery will last is not a clear-cut answer. 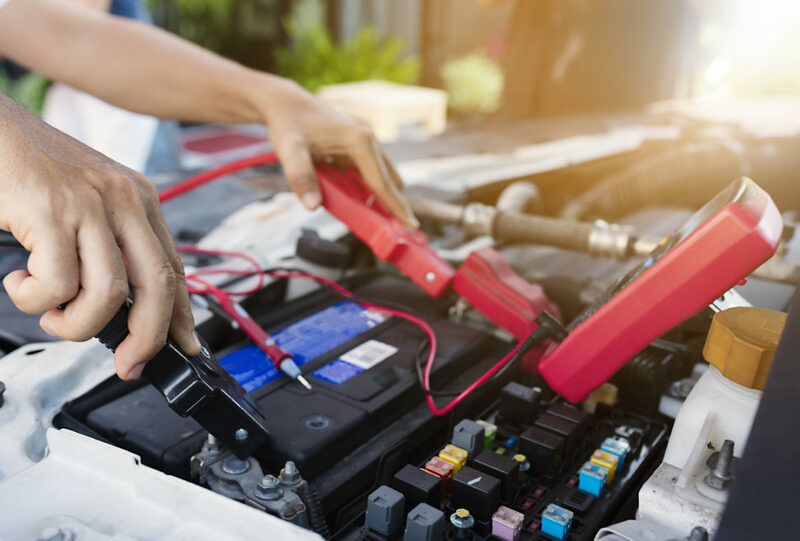 The lifespan of your battery can be determined and influenced by multiple factors such as: how often you drive the vehicle, what kind of conditions you typically drive in, the quality of the battery itself, the condition of other parts under the hood (such as the alternator) and more. When you are in the market for a new battery, be sure to check the manufacturer warranty and recommendations to ultimately determine how long you should expect it to last. All that being said, a very general expectation for the life of your typical battery is around 4 years. More important than wondering how long your battery will last is actually taking the time to monitor it. Regular battery testing is very important to maintaining the condition of your car’s battery. By doing so, you can anticipate your battery’s demise and act accordingly, instead of the alternative of finding out after it strands you on the highway in rush hour. We recommend having your battery tested twice a year to check how it’s performing. You can either do this at home yourself with a voltage testing kit or by taking it in to be done by a professional. If you are having other work done on the car, this is a great time to get it knocked out at the same time. If you are testing at home with a kit, here are some important numbers to keep in mind. A fully-charged battery should measure in at about 12.6 volts. While it is running, it should measure anywhere between 13.7 and 14.7 volts. If your readings are more than a little off of these readings, it may be a sign your battery is beginning to wear out. This is another question that isn’t so clear-cut. Like how long your battery will last, how much a battery will set you back depends on a couple factors such as: the brand of battery, how big the battery is, what kind of engine is in the vehicle as well as the make and model of the vehicle. The answer to these questions will determine whether your battery will fall on the high or low end of the price spectrum. However, a few outliers aside, the typical price range for most batteries lie between $50 to $125. This price may change also if you plan on installing it yourself or having it done by a professional. In the market for a battery? Let Raben perform a test of your old battery to determine how much longer it can serve you. Then, if you need a new one, we can get you on your way!